The core of the PRRA was drawn mainly from the SLMP (Sri Lanka People’s Party). It also had close links with the ISU (Independent Students’ Union) whose leader Daya Pathirana had been killed by the JVP and its new leader Dharmasiri was under threat and was killed in the latter half of 1989. Another group SRRA (the Socialist Revolutionary Red Army) had similar connections. The account below relies mainly on a police report. The beginnings of the PRRA are connected with the formation of death squads, mainly under leading UNP politicians. With the multiplication of these squads, they were loosely linked through a hierarchy of government politicians, military co-ordinating officers and police officers. The North Western Province (NWP) was divided into two areas coming under Cabinet Minister Festus Perera based in Wennapuwa and Chief Minister Gamini Jayawickrema Perera based in Kurunegala. Security meetings were held in these two locations with security officials, and decisions to be carried were made by these politicians. Decisions were also taken about those who did not co-operate. Colonel Janaka Perera was made co-ordinating officer for the NWP from about the end of 1988. About the same time as the PLOTE men disappeared, about March 1989, killer teams were formed based on police districts commanded by ASPs. These teams were formed of CSU (Counter-Subversive Unit) members and in the NWP. They were based in Wennappuwa, Chilaw, Puttalam, Nikeravetiya, Kurunegala, Kuliyapitiya, Mahawe and one or two other places. Several men in different units who did not take part are said to have been eliminated. Some who left the CSU had become traumatised. The PRRA put up posters in the Southern Province threatening the JVP and their first killing of an alleged JVPer was reported from Matara in November 1988. Their initial arms were those given to Socialist Alliance candidates who took part in the April 1988 provincial councils elections. It enhanced its striking capacity by getting trained militants from the Tamil group TELO. Their contact was through a TELO leader Suresh. They became active in the NWP about March 1989 where they worked in co-operation with the CSU killer squads. Sarath(Podi) Silva (PS) was the leader of this group from 1989 to1991. Testimony about his movements and contacts comes from PS’s diary as well as from Suriyaratne alias Siripala who worked as a driver for the group. PS’s contacts among politicians ranged from UNP cabinet ministers Festus Perera and Ranil Wickremasinghe to several Left politicians, mostly of the SLMP. Among the senior politicians mentioned are Y.P. Silva (SLMP and ex-CP) and Bernard Soyza (LSSP). This suggests that there was at least a reluctant consensus among the Left about responding to the JVP threat. PS himself had belonged to the SLMP. where also present were Ossie Abeygoonesekera and DIG Merril Gunaratne. Three days later PS and Dharmasiri met with DIG Gunaratne and also SSP Douglas Peiris and SP Gamini Silva, the persons running, supervising or allied to the Batalanda operation. 5th Jan: Met Minister and brought TELO team. 20thJan: Gave the assignment to Rajitha Senaratne. 21st Jan: Decided to kill Gabriel. 25th Jan: Final day of Divaina reporter. 1st Feb: Brought 2 girls. 6th Feb: Gave 9mm (revolver) to Rajitha. 3rd Mar: Ossie & YP came to residence (in Mattakuliya). 18th Mar: Met Commander Janaka Perera. 30th Mar: Met MPC Kesbewa (Kathriarachchi). 31stMar: Met MPC Kesbewa & Dr. Rajitha Senaratne. It was successful. 20th Apr: Met Janaka Perera in Kurunegala. 12th May: Both vehicles went in the night and financially settled both people. Rohana was shot. 25th May: Met Janaka Perera again. 8th Jun: Stayed the night with Dr. Rajitha Senaratne. 9th Jun: Had discussion with Pathmanathan [our note: EPRLF leader Pathmanabha?] at 11.00 AM. 19th Jun: Meeting with Ranil Wickremasinghe and DIG along with Dhamasiri and Ossie. 22nd Jun: Meeting with DIG Merril Gunaratne along with Dharmasiri. PS was based at the HQ, which was the house of Shelton Nonis, an SLMP member of the provincial council, in Wenappuwa. Apart from the domestic staff, about 40 were employed there. A similar operation, we understand was run from the house of Chandana Kathriarachchi of Piliyandala, a Western Provincial Council member, also from the SLMP. Siripala, a driver who worked for PS, testified that he once went to the latter place from which they brought 3 detainees. He does not know what happened to them. PS’s group was given a Pajero and a Mazda vehicle and borrowed other vehicles when required. They once took Festus Perera’s Pugeot 504 to carry out an assassination in Dummalasuriya. They also had a centre at or near Dankotuwa Police Station. 25.1.89 -Went to Dankotuwa, met Alwis. That was the last day the Divaina reporter lived. 20.6.89 – Went in the night with Alwis and settled Ossie’s financial account. 26.6.89 – Met Alwis and did a round up with him. Went to Mankulama and brought a watcher [of an estate]. July ’89 – At Haladawatawana school shot one person and arrested another. 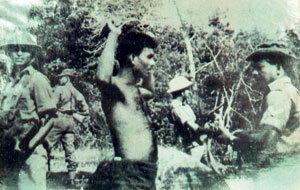 May ’89- Took a detainee from Dankotuwa Police Station and shot him dead at Koduwai. Shot dead someone coming after service from Katuneriya Church. Also reported are the arrest of Peter Thanisius Fernando who was released after a payment of Rs. 10,000, and the killing of 2 TELO members. 29th Jul: Brought Marshal and kept under custody. Went at 6.00 AM to Marshall’s house and received Rs. 5 lakhs. The latter stages of the operation in the second half of 1989 were characterised by mass killings. The CSU groups in Chilaw, Puttalam, Kurunegala, Gampaha and Colombo districts worked together, switching vehicles and abducting from different areas where the officers were unknown. No one could identify who abducted whom. Dead bodies from Negombo, Gampaha, and Peliyagoda (i.e. Batalanda) were dumped into a large cave in Ruwanwela that the river flows into. The testimony above transpired in an investigation done by L.G. Wimon Perera, Chief Inspector, Chilaw Police, in mid 1997. The report was sent to DIG Dr. Dharmadasa Silva. The investigation was taken over by the CID and is for practical purposes, stalled. We may note that a part of this story which transpired in the Police investigation into the PRRA, runs into and complements that reported by the Batalanda Commission. The Commission comprised Justice D. Jayawickrama, Court of Appeal, and Hon. N. E. Dissanayake, High Court, Colombo. The Commission found (vide CDN 18.12.99) Mr. Ranil Wickremasinghe, then minister for science and industries and Mr. Nalin Delgoda, then SSP Kelaniya, indirectly responsible for the maintenance of the ‘unlawful detention and torture chambers’ in certain houses of the Batalanda Housing Scheme. These chambers were used by CSU (Counter Subversive Unit) men under ASP Douglas Peiris. The Commission moreover found that unauthorised security meetings were held in two houses in the Batalanda Scheme that were assigned to Minister Wickremasinghe. Merril Gunaratne DIG, Greater Colombo; Nalin Delgoda, SSP, Kelaniya; Douglas Peiris, ASP, CSU; and Raja Dias, ASP are named as some of the police officers who attended these unauthorised security meetings. The Commission observed that these officers tookorders from provincial and national politicians (two other UNP MPs in the locality were John Amaratunge and Joseph Michael Perera) and on their own admission received promotions and other benefits through politicians (Sunday Times 12.4.98). IGP Ernest Perera testified that at Mr. Wickremasinghe’s bidding, he had the lawyer Liyannarachchi brought from police custody in Tangalle and handed over to the ‘special team’ under Douglas Peiris on 1st Sept. 1988. Liyannarachchi was hospitalised about midnight on the 2nd and succumbed shortly afterwards. What we have from the story of the PRRA again points to SLMP and ISU officials connected with it meeting Ranil Wickremasinghe and DIG Gunaratne in the Batalanda Scheme. PRRA too was closely associated with the CSU. It may be noted that rather than use the Batalanda Commission Report to initiate legal proceedings, President Kumaratunge had 21 months after receiving it, used extracts as election propaganda (e.g. at the Dec. 1999 presidential election). The selective use of commission reports, which become the property of the executive president, as propaganda, was started by Jayewardene (e.g. Sansoni Report). It diminishes the standing of theJudiciary. We now move onto a more sophisticated operation against the JVP. So Ranilge Gamini what have you to say? Wijeweera was a pathetic opportunist who used violence to get to the leadership of the country through a short cut. The whole country was in a mess and extraordinary measures were required to take the country back into stability. What is pathetic is those who took extraordinary measures against JVP and those who were responsible for ending JVP violence took a completely opposite stance when extraordinary measures were taken to finish off LTTE, which was a far more deadly enemy of the country. Power of the dollar I guess. So, that is the story of our history and culture in SL. Marxism is achieved through revolution where ever in the world. Also, we should stop getting help from the Chinese whose story is no different; Mao and his violent revolution, plus the mismanagement that lead to the starvation of over a million Chinese. WHEN REBELLIONS FOR THE MASSES SUCCEEDS IT USUALLY LEADS TO GREATNESS; UK, FRANCE, US, USSR, SOUTH AMERICA, CHINA, VIRTNAM, JAPAN….IN SL THEY ARE ALL FAILURES; 1818, 1848, JVP…. THE ONLY SUCESSFUL REBELION IN SOUTH ASIA WAS ALSO MAERXISM’S LAST/NEWEST REBELION; A FEW YEARS AGO IN THE LAND OF THE BUDDHA; NEPAL. Wijeweere was a lunatic. Less you talk about him, the better. These are the events that brought about the downfall of the UNP. Also the politicisation of the police and the proliferation of armed groups. Some of these politicians are still with us and I wonder how they can live and speak with a clear conscience. The JVP armed insurrection should have been brought under control using the armed forces and legal methods instead of unleashing death squads and extra-judicial killers. For instance the killing of school children in Embiliptiya cannot be condoned under any circumstances. They were victims of the lack of the rule of law. This situation may explain in part why there is nowadays hardly any reference to the Embilipitiya schoolchildren’s massacre. At Embilipitiya, 48 schoolchildren were abducted and murdered between 2 August 1989 and 10 January 1990. The murderers were Sinhala, the victims also Sinhala. The murderers were members of the Sri Lankan army, or their associates. The victims were not insurgents nor suspected insurgents. So the massacre does not fit with those same conventional categories. It upsets all of the polarised ideological positions that characterise discussion about the bloodshed in Sri Lanka. Therefore Embilipitiya is avoided. Nor did they exist for the parents of the youths killed at Bindunuwewa. At the Bindunuwewa rehabilitation camp, 25 young men were hacked to death by a local mob on 25 October 2000. The murderers were Sinhala, the victims Tamil. The police officers and others responsible for the camp, also Sinhala, did nothing to stop the attack. No doubt the motivation for the killings at Bindunuwewa was racial. But does that factor alone explain what happened? Why weren’t the victims protected? Why weren’t the police and armed forces mobilised to foil the attack? The common feature of the two massacres, lost among all the racial and ideological positions taken on the killings, was the absence of the rule of law. Thus is the recent history of our country, tarnished by political killings and the blood of innocent people. The brutalisation of society and the twisted logic of justifying the absence of justice and brutal killings by simply saying ‘This was neccesary for our security’. Dead bodies are surfacing all over the country. Justification of injustice and barbarianism for the greater good of whom? our landscape in the 1988/89 period was a response to the JVP reign of mindless and savagery they unleashed on the people and the country during that time. Wijeweera and his killers took sadistic pleasure in bringing the country down to a halt on many days resulting in many political assassinations. There are many who believe men like Ranjan W, in fact, the saved the country from going down the Pol Pot way – although the means adopted were extra-legal in the end the country was saved. There is a similar parallel in Chile where many give credit to Gen. Augusto Pinochet despite the raging controversy of the Disappeared Ones. What happened in the 1988/89 period was a further demonstration of the virtual collapse of our society from the high values it held earlier – all sacrificed at the altar of political expediency. We have still not addressed the inherent cancer within us. The superficial curative efforts so far have been only to deal with the fissures in the surface. JVP is the worst cancer Sri Lanka had and still have. This is the part where they are getting the taste of their own medicine. Wijeweera PND,allies, Rohan, Attnayke so-called founder of JVP had been originated which rampant violence and damage, to the Working class & democratic movement in Sri Lanka since 1965. Its lost of movement of JVP which as similar as Old left Parties by betraying working class movement under the guidance of Trotskyism. Model of Trotskyism politics is reformism of Old left and JVP model of Anarchism politics is Terrorism by Wijeweera are two sides of same coin of anti-socialist & anti-democratic politics in an Island. Needless to say misguided policies and principles By So-called Left that since 1935 Left movement an open path that has large number of people LOST political leadership; lost of their life, time, ideology of politics and as well as democracy task is immensurable. No accountability or responsibility taken by Old-left or JVP, since 1935. Better to Dissolve JVP under New Leadership Dr Anura Dissanakaye as quick as possible. That is one of great services to People of Sri lanka by Dr Dissanayake. Old left has to follow same foot path, that is sooner the better! Comments should not exceed 300 words. Embedding external links and writing in capital letters are discouraged. Commenting is automatically shut off on articles after 10 days and approval may take up to 24 hours. Please read our Comments Policy for further details. Your email address will not be published. © Colombo Telegraph 2011 – 2019. All rights reserved.